May | 2011 | Paul's Voyage of Discovery & Etc. 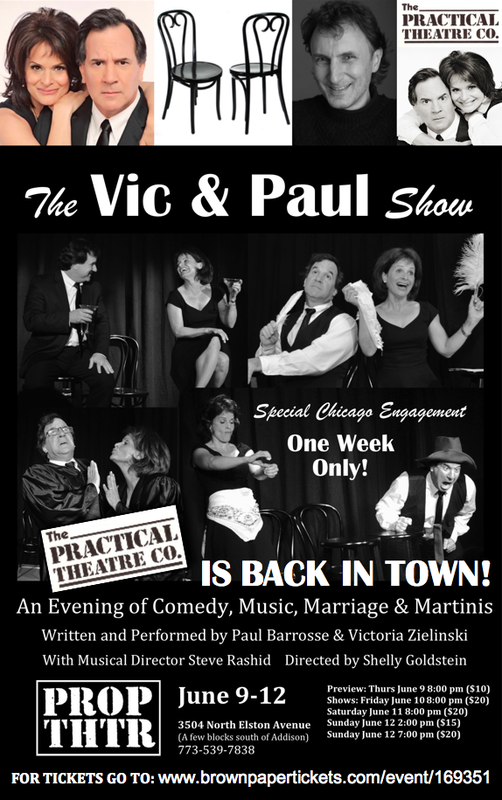 As of today, there are less than two weeks before The Vic & Paul Show opens in Chicago for a one-week engagement, June 9-12, at the Prop Theatre. My wife Victoria and I have just returned from a wonderful trip to Chicago and Evanston. It was a perfect weekend: a blissful mix of business, pleasure, family and friendship — right up until (almost) the very end. 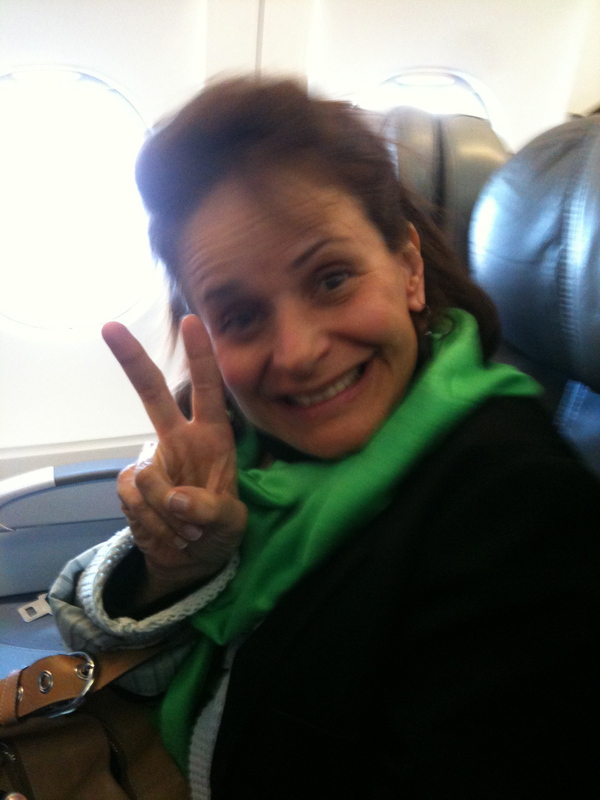 On Friday morning, May 20th, Victoria and I boarded our Spirit Airlines flight bound for Chicago. 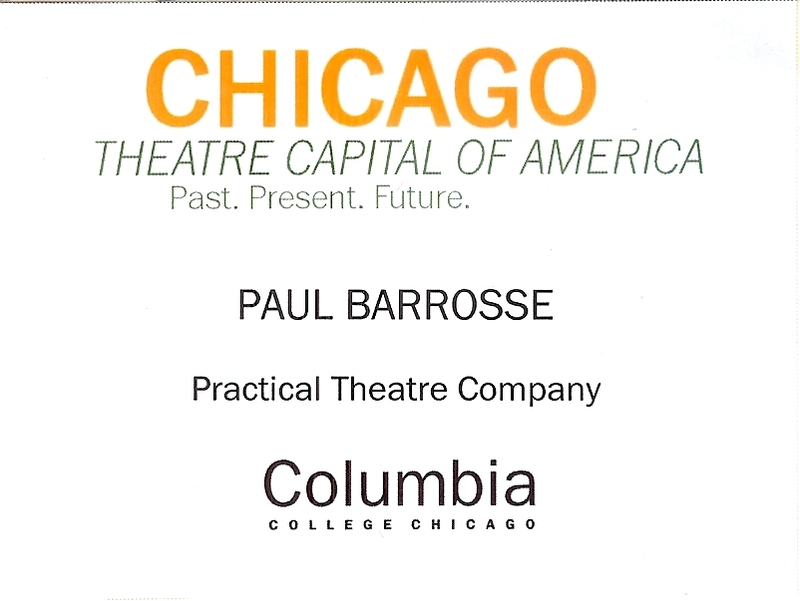 The next day, we were scheduled to make a presentation on the history of The Practical Theatre Company at the first Chicago Theatre Symposium at Columbia College. We’d never flown Spirit Airlines before, but Vic had given me the job of booking our travel – and swayed by Bill Shatner’s performance as “The Negotiator” in all those Priceline commercials, I used that service for the first time. Spirit looked like the cheapest way to go. But cheapest, I would later learn (once again) is not always best. We had a 90 minute layover in Las Vegas, and spent our idle time doing the kind of thing the devil encourages in idle minds: we gambled. With poker machines right there in the airport – how can you resist? It was an omen of a great weekend-to-be when I put $5 in a machine – and moments later, walked away with $82.50! We were leaving Las Vegas ahead of the game. It doesn’t usually go that way. When we arrived in Chicago at about 2:30 in the afternoon, the sun was shining and the temperature was in the low 60’s: the kind of spring weather that requires sweaters and jackets in Los Angeles. But as we drove east on Dempster Street toward Evanston, teenagers in t-shirts drove by in top-down convertibles like it was a hot summer day in Malibu. 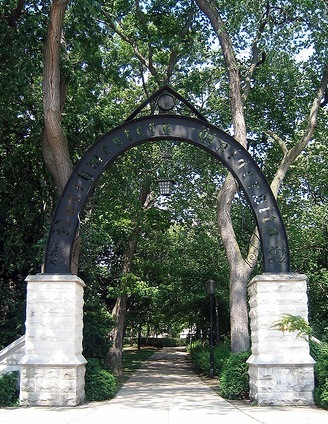 We picked up our daughter, Emilia (a sophomore at Northwestern) who said this was one of the few sunny days all spring – and that kids were losing their minds, running around in shorts, halter tops and sandals as though basking in a heat wave. That we’d come to town on one of the few sunny days was another good omen. Alas, the forecast was for rain the next two days. But, for the moment, the sun was shining and Evanston was picture postcard pretty. You’d never know it had all been frozen tundra not long ago. Steve and Bea Rashid, our good friends and hosts, were preparing a barbecued pork loin feast as we pulled up to their warm, wonderful home. Steve is our longtime musical director, and the music man for The Vic & Paul Show. 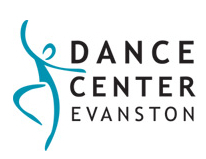 Steve’s wife Bea, a dancer and choreographer, is the Director of Dance Center Evanston – one of the town’s cultural treasures. We couldn’t imagine a better way to start our weekend than to enjoy a backyard BBQ with the gracious and talented Rashids, including their son, Daniel, a senior at Evanston Township High who’ll attend The University of Southern California in the fall. The next morning, Saturday, we drove downtown to get to Columbia College by 9:00 for the start of the final day’s sessions of The Chicago Theatre Symposium. As Vic and I walked up to 1104 South Wabash, home of the Columbia College Chicago Film Row Center where the symposium was being held, the first person we saw was the most auspicious sign yet that our weekend was blessed. Crossing the street and headed in our direction was none other than Sheldon Patinkin – our beloved, legendary comedy guru! 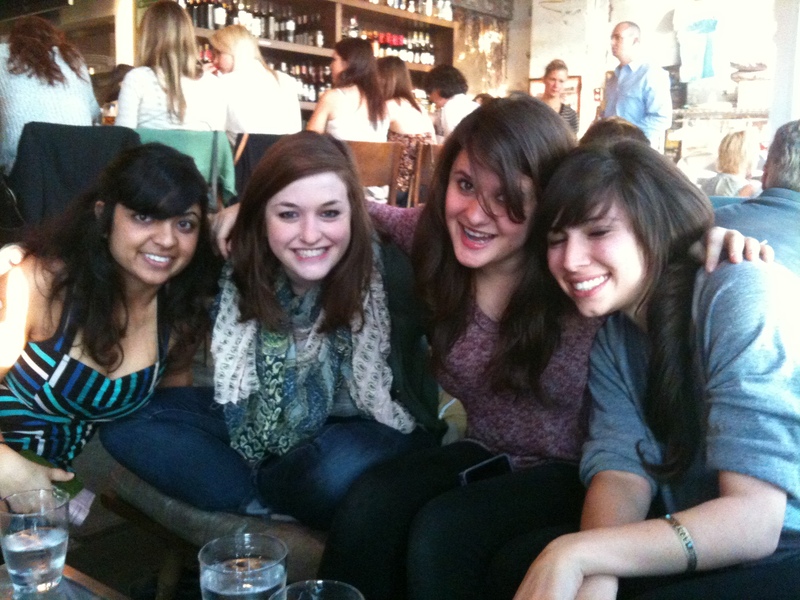 Those who have read my history of The Practical Theatre on this blog know the impact that Sheldon has had on our lives. If there was one person we wanted most to see that day, it was Sheldon. And here he was! 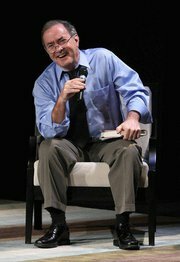 We greeted him with genuine joy and walked into the symposium at his side. 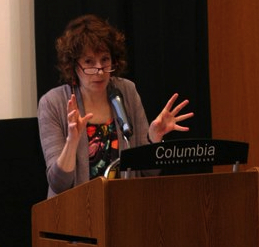 The first speaker was Kathleen Perkins, an Associate Professor at Columbia College, who spoke about “Inspirational and Influential Chicago Teachers and Leaders,” including Winifred Ward, the late Bella Itkin – and our own Sheldon Patinkin, who has made an indelible mark on comedy and theatre, from his work with the original Compass Players, Second City, SCTV and the PTC – to Columbia College, The National Jewish Theatre, Steppenwolf and on and on and on. Then, the session really began to feel like Old Home Week. 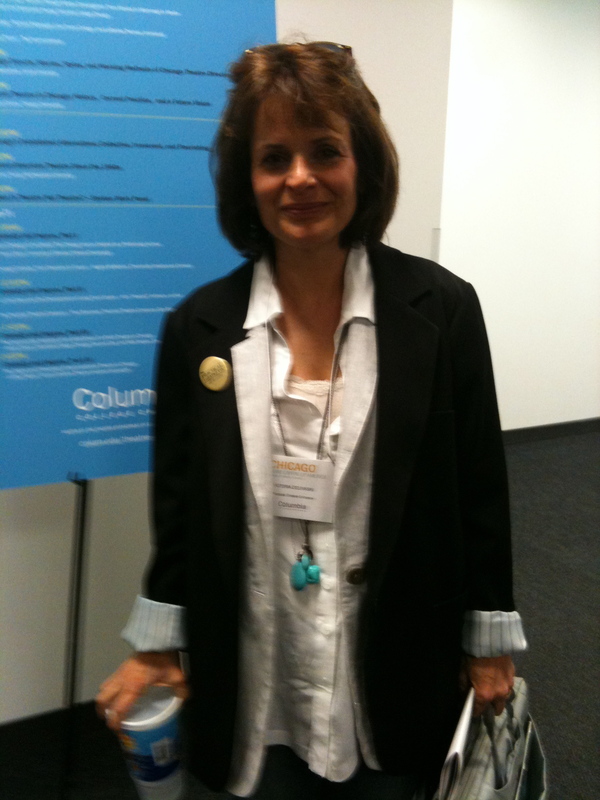 Kathleen Sills spoke next. 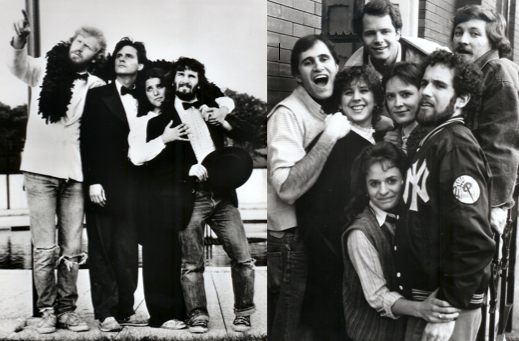 Another NU contemporary, Kathleen founded Lifeline Theatre in 1982, along with four other NU pals of ours, Meryl Friedman, Suzanne Plunkett, Sandy Snyder and Steve Totland. Kathleen gave a presentation on one of Northwestern’s most famous and influential theatre professors, the venerable Alvina Krause. Kathleen’s presentation, “Alvina Krause, Humanities, and the Anti-Conservatory”, added rich detail to a theatrical legend that Victoria and I had been aware of since our days at Northwestern. Krause had retired years before I arrived at NU in the fall of ‘76 – but long after she left the theatre department, her presence was still powerfully felt. 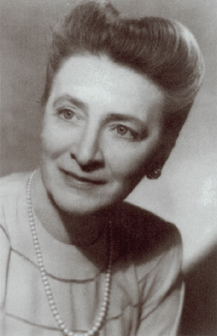 Krause established herself in Bloomsburg, Pennsylvania in 1971 and many NU students made pilgrimages there for master classes with their guru. In fact, one of Victoria’s closest NU friends, Elizabeth (Betsy) Dowd, was among those students who, in 1978, founded the Bloomsburg Theatre Ensemble, with Krause (then 85-years old) as artistic director. Krause passed away in 1981, but Betsy and her husband Rand Whipple (another NU pairing) are still making the Bloomsburg Theatre Ensemble a vital part of their community. Victoria is ready for the symposium. The next presentation, “Robert Breen and the Rise of Narrative Theatre in Chicago”, also hit close to home. 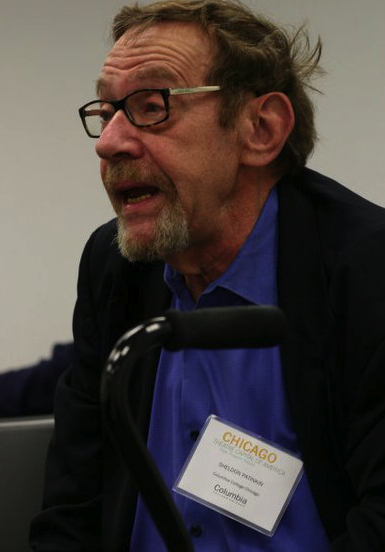 Northwestern professor Paul Edwards gave a spirited account of Breen’s seminal work with Chamber Theatre – a theatrical form in which short stories, novels, and other prose works were brought to life onstage, incorporating the narrator as a central character. This was a technique I’d learned from one of Breen’s students, Frank Galati, whose brilliant class “Interpretation of Prose Fiction” was a must for aspiring actors and directors during by days at NU. Victoria was an Interpretation Department major, and among her most inspirational teachers was Breen’s colleague Wallace Bacon, whose essential “Interpretation of Shakespeare” class was affectionately known as “Shake and Bake”. 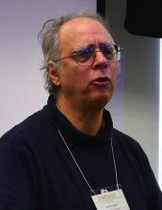 In our era at Northwestern, the creative excitement, energy and ideas emanated from the Interpretation Department, with teachers like Galati — and his estimable predecessors Breen and Bacon – inspiring a generation of artists to think way, way outside the conventional theatre box. 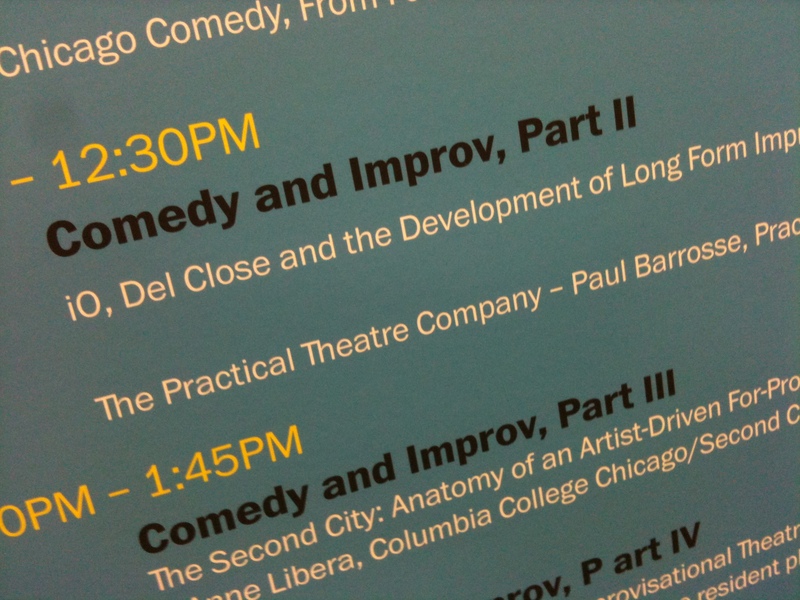 The session began with a presentation on “Del Close, iO, and the Development of Long Form Improv” by Kim Johnson, author of The Funniest One in the Room: The Lives and Legends of Del Close, and Del’s longtime business and creative partner, Charna Halpern, who is still the producer of iO (Formerly Improv Olympic) which she and Del founded in 1981. 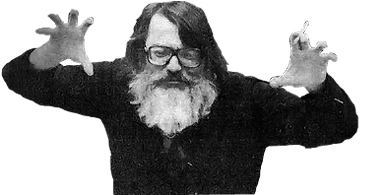 The late, great Del Close is a genuine American improv comedy legend: a veteran of the Compass Players in St. Louis (with Mike Nichols and Elaine May), Second City in Chicago, The Committee in San Francisco, Ken Kesey’s Merry Pranksters, Saturday Night Live – and finally Improv Olympic. 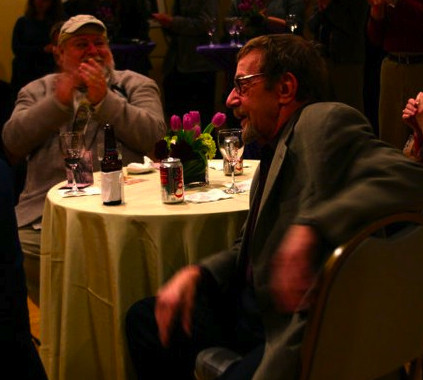 Brad Hall and I met Del when we shared a dressing room with him during the 1984 Goodman Theatre production of “A Christmas Carol” – and Rush Pearson and I planned a show with Del (to be called The Secret Show) in which Rush and I would act as assistants/acolytes to Del’s mad comedy scientist. 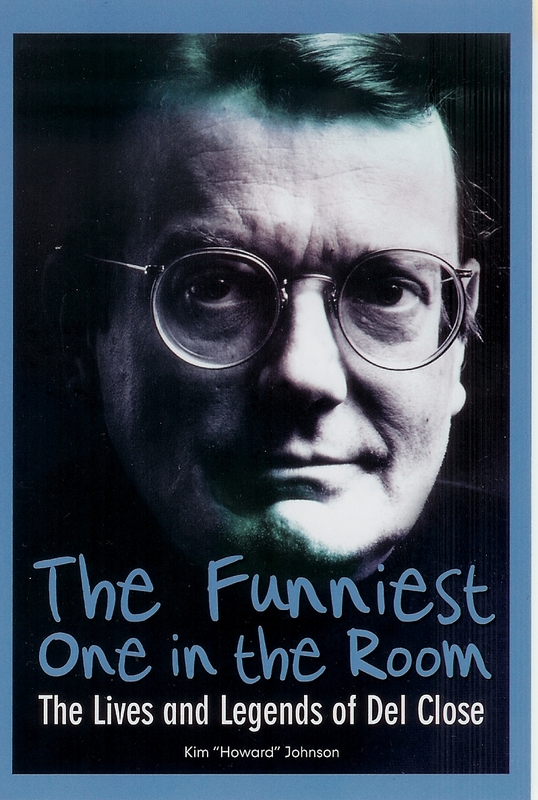 The Secret Show never went beyond one memorable appearance in Irv Rein’s class at Northwestern in 1985 – where Del explained the basic roles of comedy as he saw them, as his two clownish henchmen acted them out. That same year, Del became an honorary member of The Practical Theatre Company in a ritual during which a watermelon was disemboweled – and Del’s red-painted footprints were enshrined on the sidewalk in front of The John Lennon Auditorium. Victoria ribbed me as “the Herodotus of The Practical Theatre” for preparing an 18-page script for our presentation – but clearly, a more informal talk was in order. Luckily. I know my PTC history fairly well (having lived it) and Victoria chimed in with well-timed details, statistics, and comic asides – often at my expense. (Lovingly, of course.) Sheldon added his own color commentary – which was personally satisfying, as Sheldon’s impact on those of us who were privileged to work with him at the PTC was (and is) immeasurable. For Vic and I to be making this presentation at Sheldon’s college, and to have him there while me made it, cemented the fact that we were in the right place at the right time. 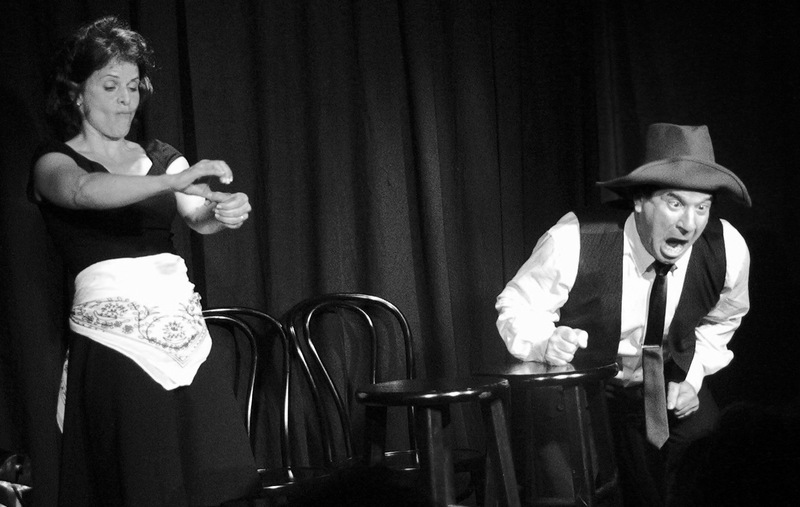 Afterward, we made sure to plug The Vic & Paul Show – which will be playing from June 9-12 at the Prop Theatre in Chicago. And I’ll plug the show here, as well. Following our symposium appearance, Vic and I had an appointment to meet The Reader’s Tony Adler at the nearby 11 City Diner. His plan was to interview us for an article to appear in The Reader on Thursday, June 9th – the day The Vic & Paul Show opens in Chicago. 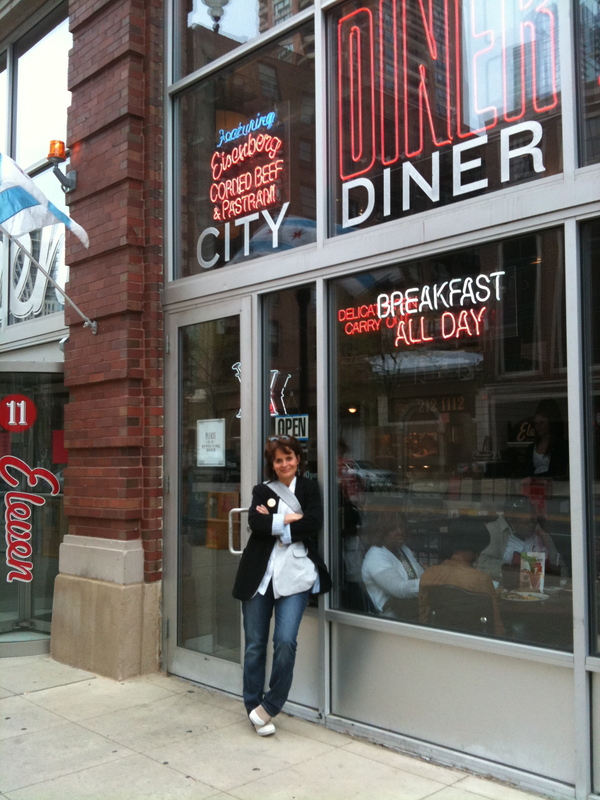 The 11 City Diner is trendy, quite busy and pretty loud. Tony joined us and we got seated at a booth, our waitress arrived, and we ordered drinks. But we didn’t order food. Don’t worry, we told our waitress, we’d take care of her. Tony turned on his tape recorder – and he’d barely begun his interview when a restaurant manager sauntered up to our table, reminded us how busy the diner was at lunchtime, and suggested we might “be more comfortable” upstairs (where it was even louder.) We protested mildly that we intended to take care of our waitress, but the manager was not to be deterred. With the smooth yet forceful false friendliness of a veteran Division Street bouncer, he had another suggestion: we might be even “more comfortable” in the quieter confines of the Columbia College student union just a few doors down the block! In fact, he escorted us the few hundred feet down Wabash and practically opened the door to the student union for us. 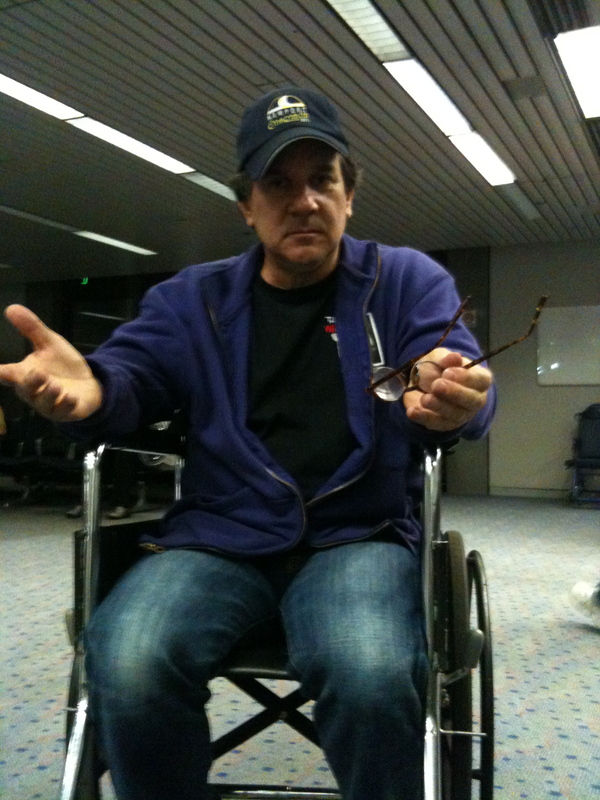 The whole episode was beyond odd, and Tony, Vic and I recognized that we were living a comedy sketch. But, like any good comedy sketch – there was another twist. The “quiet” student union the manager promised was not so quiet. It looked like a band was setting up to rehearse – and as soon we sat down and Tony turned his tape recorder back on — a percussionist began banging away on various exotic gourds and wood blocks. By the end of our interview the band was in full swing – with a horn section blaring away – and the three of us were huddled close around Tony’s tape recorder, trying to have a conversation about the return of the PTC to Chicago, parenthood, the glory of living in Evanston (Tony’s an Evanstonian) and of course, The Vic & Paul Show. We thoroughly enjoyed our conversation with Tony Adler – and we appreciated that the band rehearsal was one of life’s unexpected punch lines. Someday soon we’d love to continue our conversation with Tony. There’s not a nicer, more informed and erudite guy to talk to — or get thrown out of a restaurant with. There was also a Rockme connection to the next item on our Saturday evening agenda. Our Rockme band mate, Maurice “Mr. 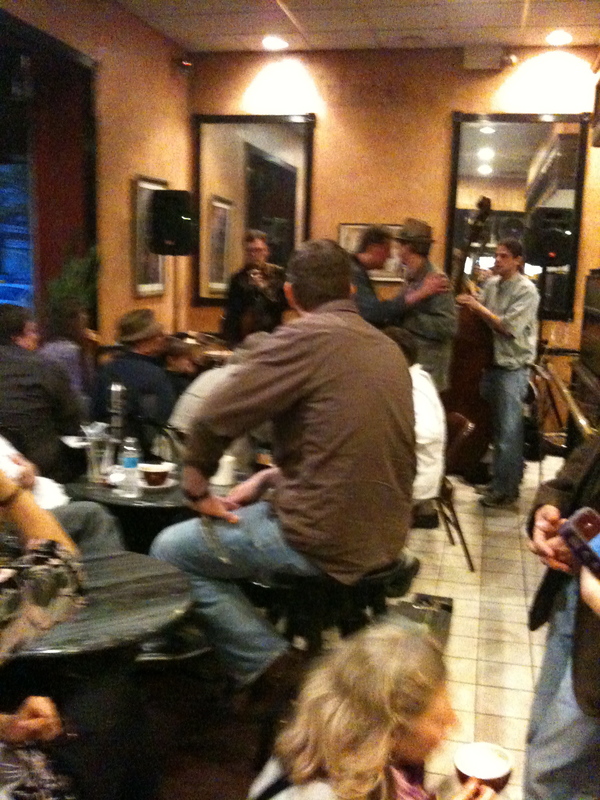 Mo” Cleary was playing a few Bob Dylan songs on his ukulele as part of a 70th Birthday celebration for Dylan at Evanston’s Café Mozart at 600 Davis Street – just a short walk from Union. After the show at Café Mozart, we said goodnight to Emilia, then went home to Steve and Bea’s house and played Mahjong for the first time. It’s hard enough to learn Mahjong – but when you start off with hardly any sleep, a long, busy day, and two glasses of Chardonnay – it doesn’t get any easier. At the end of the game, all four of us were just one tile short of victory. And we were also out of gas. The next day, Vic, Steve and I rehearsed the songs for The Vic & Paul Show – including our just-written musical tribute to Chicago’s brand new Mayor Rahm Emmanuel. We spent lunchtime with our good friends and former NU classmates, Nili Yelin and Bill Wronski. 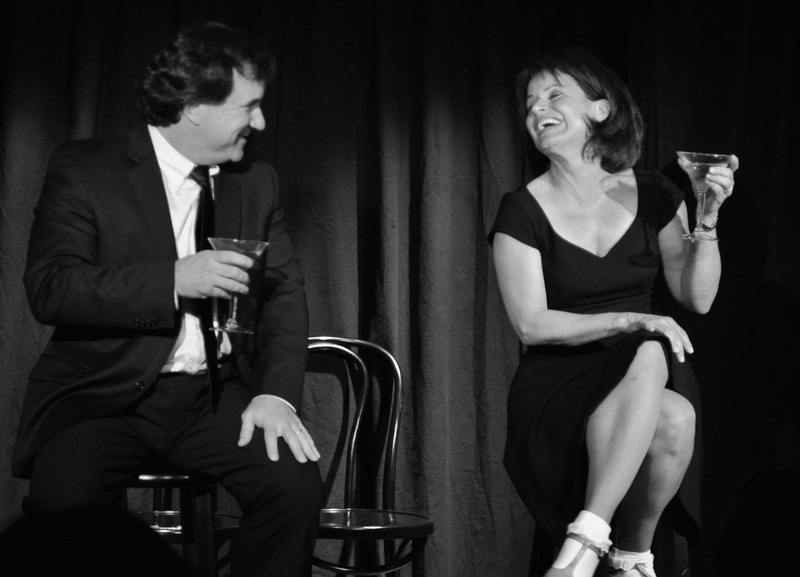 Vic and I both performed in improv comedy groups with Bill back in the day — and Nili was one of my close theatre department classmates. 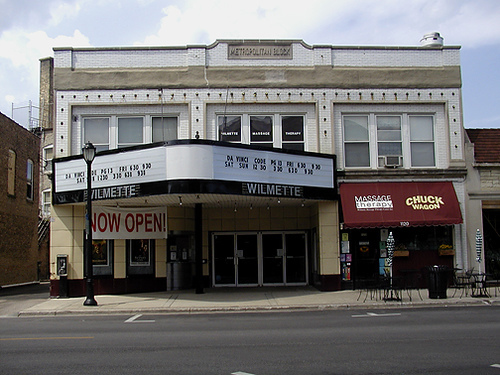 Nili now helps to run the landmark Wilmette Theatre. After lunch, she showed us around this cultural treasure, built in 1913. If you live anywhere near the North Shore, you’ve got to check out what they’re doing at The Wilmette Theatre. Time was running out on our dream weekend, and our flight back home was just hours away, so we threw our bags in the trunk, jumped into our rental car, and made one last stop to meet our daughter Emilia at Kafein, a groovy local coffee shop. (One of the dozens that now exist in Evanston. The number of groovy coffee shops back in our day? Zero.) Rain was starting to fall as we said goodbye to our darling Emilia and headed out to O’Hare for our 7:50 pm direct flight back to Los Angeles. As I said at the beginning — our perfect weekend of business, pleasure, family and friendship would end on a less than perfect note. Due to the tornadoes in Missouri and other threatening weather in the area, our 7:50 flight to L.A. was cancelled (after several dispiriting) delays) at about 9:00 pm. 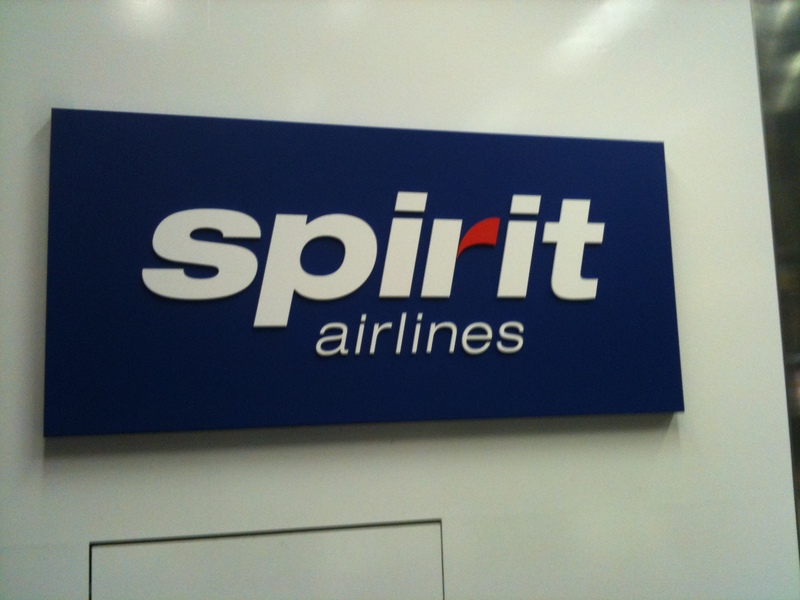 To make matters worse, Spirit had only one more flight going west that night: to Las Vegas, leaving at 10:00 pm and arriving at 2:00 am. But the Spirit personnel at the gate could not arrange to put anyone on that flight. We would have to go to the ticket counters downstairs. By the time we got to the ticket counters, there were about a hundred disgruntled, increasingly agitated people already in line – so Vic started working the phone. She directed me to get in line. While in line, I heard a ticket agent in the very empty First Class line call out, “Anyone going to Vegas?” I raced over to take my spot, just third from the start of the line. When the ticket agent tried to clarify that she was only referring to travelers going to Vegas – and not those intending to go on to Los Angeles – those of us in line made it clear that we were not going anywhere. She relented. A victory. 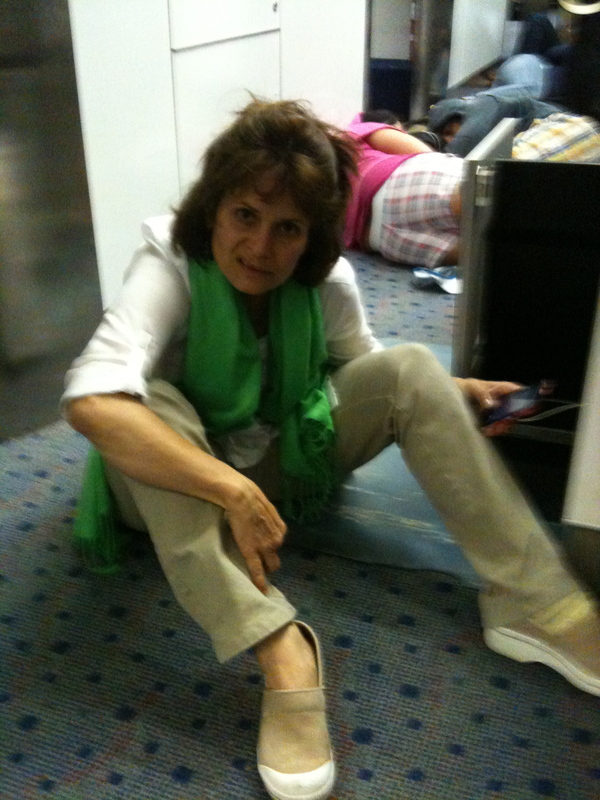 Soon, Vic walked up to say she’d booked us on the 10:00 pm flight to Vegas — and within minutes we’d checked our bags, gone back through security, and took our places at the gate, waiting until about 10:30, when the flight finally took off, just ahead of the approaching storm. 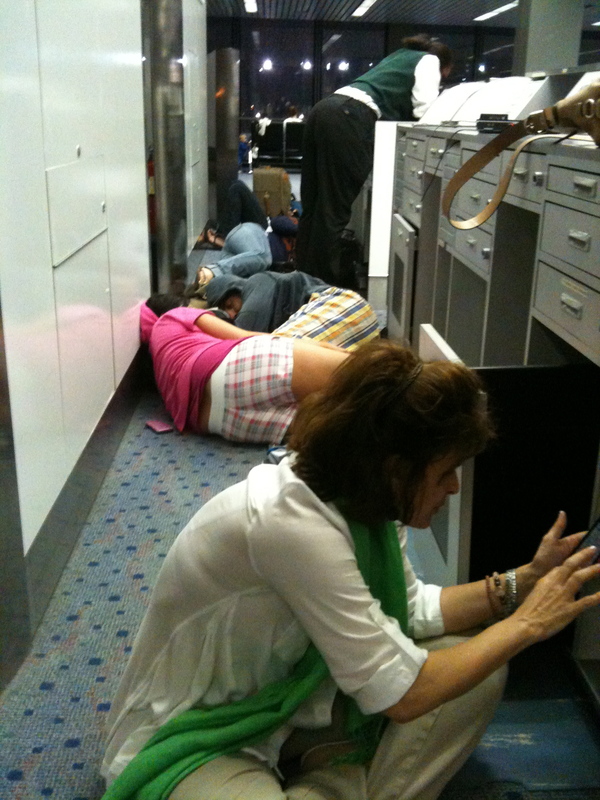 We got to the Vegas airport at 2:00 am, picked up our bags at baggage claim, and for the next four hours, we tried to find comfortable spots in McCarran Airport to plug in our failing cell phone and catch a few winks before the ticket counters opened at 6:00 am – at which time we could check our bags for our 8:00 am flight to Los Angeles. By 10:00 am, we were back at LAX and by 11:00, we were home. By Noon, Vic was at school and I was at work. Tired, to be sure — but happy to have spent a wonderful weekend in the treasured city that will always be home in our hearts. From the time that man first fashioned craft to ply the deep waters, hardy folk have braved the dangers of the sea for sustenance – risking the roiling waves for the bounty the oceans provide. Others have taken to the sea for exploration and conquest, striking out for unknown shores to discover new lands and plant their flags upon them. Others go down to the sea in ships for sport, to test themselves against the fickle and ferocious elements of wind and water, to ride the exhilarating edge of speed and danger in a fast boat, sails full of howling wind, the taut rigging straining, cracking on, bow waves drenching the gunnels as they race through the swell. 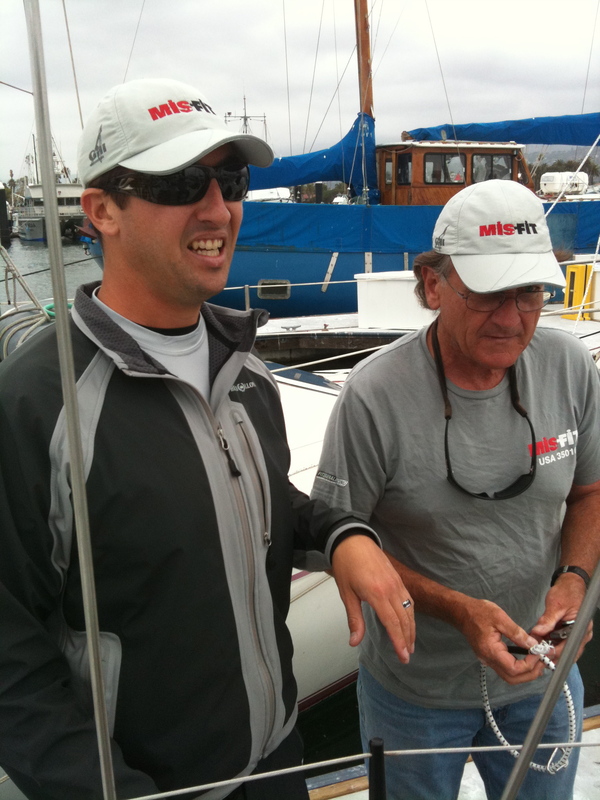 Master Eric and his father Joe the Ancient Mariner in Santa Barbara Harbor. The men of Misfit number themselves among the latter category of sailors. And that is why Captain George Moll, Master Eric Schlageter and a crew of six intrepid adventurers gathered on the dock at the harbor in Santa Barbara, California on the morning of Saturday, May 14, 2011: to take part in The 31st Annual Hardway Race, sponsored by the Pierpont Bay Yacht Club. The Hardway Race is the first installment of the 12th annual Island Series, a set of three races that feature voyages to the nearby Channel Islands. 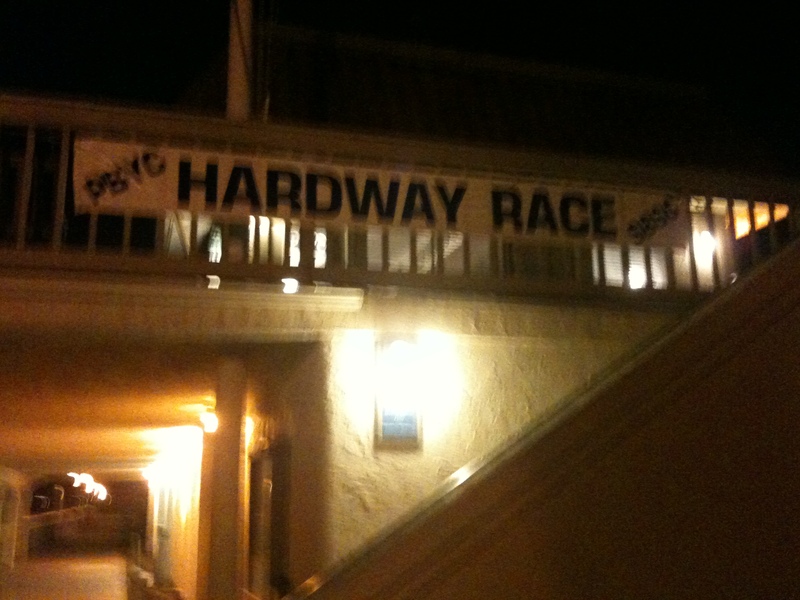 To go “The Hardway” means to race from Santa Barbara to Ventura Harbor by going around Santa Cruz Island – a journey of 67 nautical miles. Master foc'sl'man Claude enjoys a celebratory cigar before we shove off. 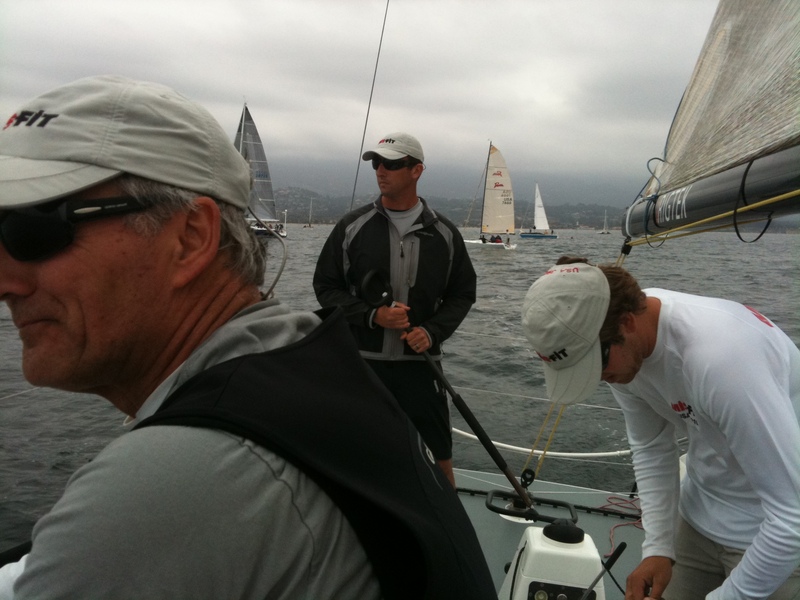 I’ve been living in the Los Angeles area for two decades, and I’ve raced with Captain George in the Santa Barbara Channel for several years now – but I’d never sailed around the backside of Santa Cruz – so I was excited to be in this race. It’s wonderful to be able to explore exotic, unseen lands so close to home. 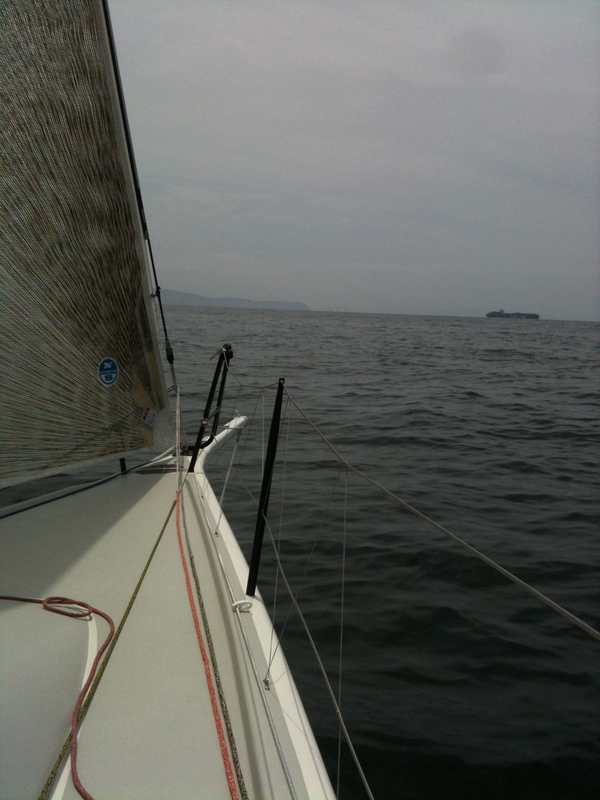 I’ve sailed around Santa Cruz’s nearest island neighbor, Anacapa, many times. Anacapa is always a stunning sensory treat with its jagged shoreline, steep, rugged cliffs and zillions of seabirds. But going around Santa Cruz was going to be something special. Somewhere I’d never been before. We motored toward the starting line, where the other boats in our class were jockeying for position prior to our 11:00 am start time. At 35-feet long, Misfit was among the smallest of the boats contending in the spinnaker class that had chosen to go “The Hardway” around Santa Cruz. 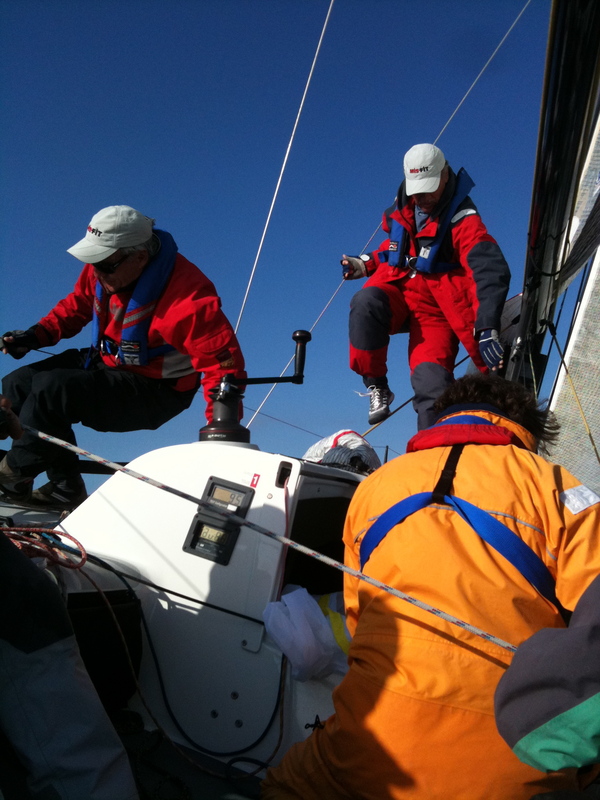 Indications were that the wind would be up, so the Captain ordered us into our foul weather gear from the jump. When you see Eric’s dad, Joe the Ancient Mariner, donning his foulies, you’d best follow his veteran example. If Joe thinks we’re gonna get wet – we’re in for soaking. 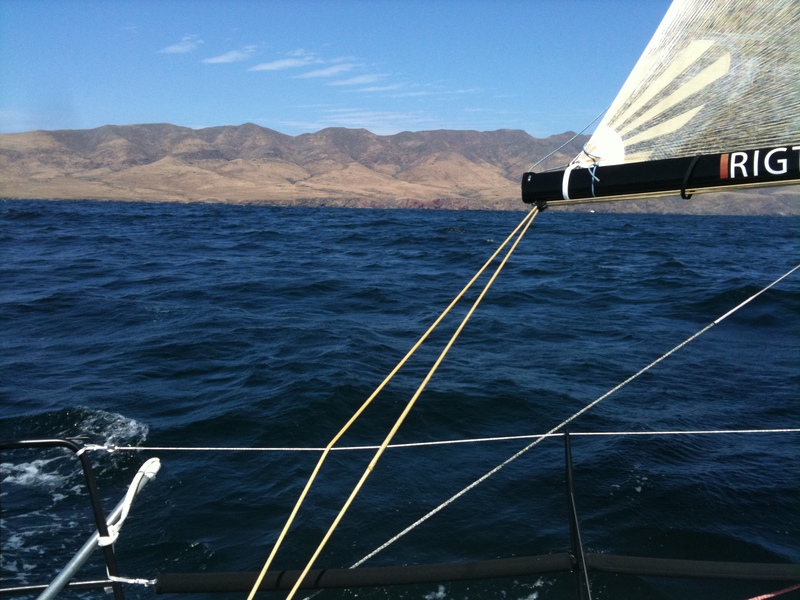 Within two hours sailing, we neared the western point of Santa Cruz Island at a speed of 8-10 knots. Luckily, a huge container ship crossed our bow about a half-mile ahead of us. At least one of the leading boats was not as lucky — and had to diminish speed to steer around the container ship. We had a similar experience with an oceangoing barge approaching Anacapa on my first Hardway Race two years ago, so I was glad to see that container ship pass safely in the distance. As we made the Santa Cruz headland, I was greeted with a sight I had not expected: there were two more islands in the distance beyond Santa Cruz: Santa Rose and San Miguel. I’d never seen either of these westernmost Channel Islands before, and it was a thrilling discovery. 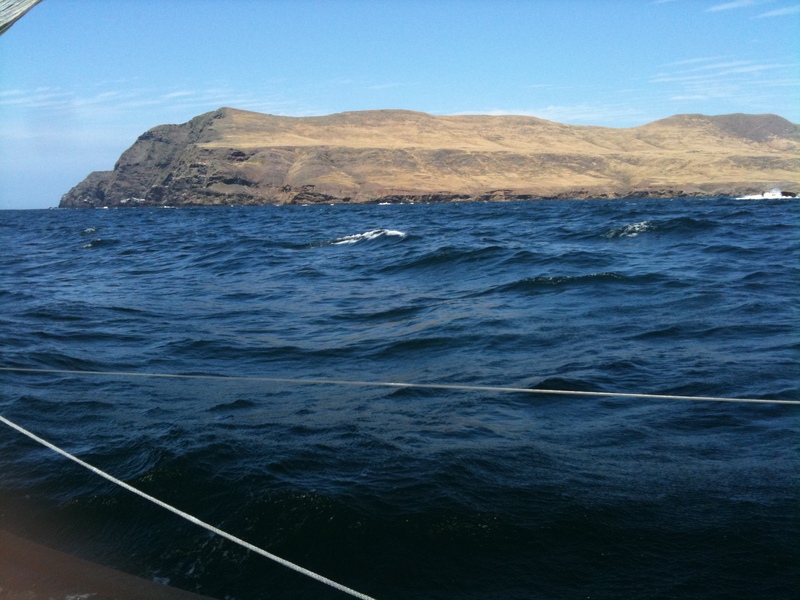 Once out of The Potato Patch, the northerly winds died a little as we passed under the lee of the imposing cliffs and mountains of Santa Cruz. Between jibes, as we sought the shifting winds, I got a good look at the magnificence of Santa Cruz. Santa Cruz was once the largest privately owned island in the nation, but now its jointly owned by the National Park service (which owns 24%) and the Nature Conservancy (which owns 76%). 22 miles long and from 2 to 6 miles wide, it’s the largest of the eight islands in the Channel Islands chain. Steep, sea-battered cliffs, surf-filled caves, and a few sandy beaches make the coastline of Santa Cruz well worth the voyage. Rising above it all is the high ground known as Devils Peak, the highest prominence on the island at 2,450 feet. Geno in the cockpit with the sea cliffs of Santa Cruz rising behind him. 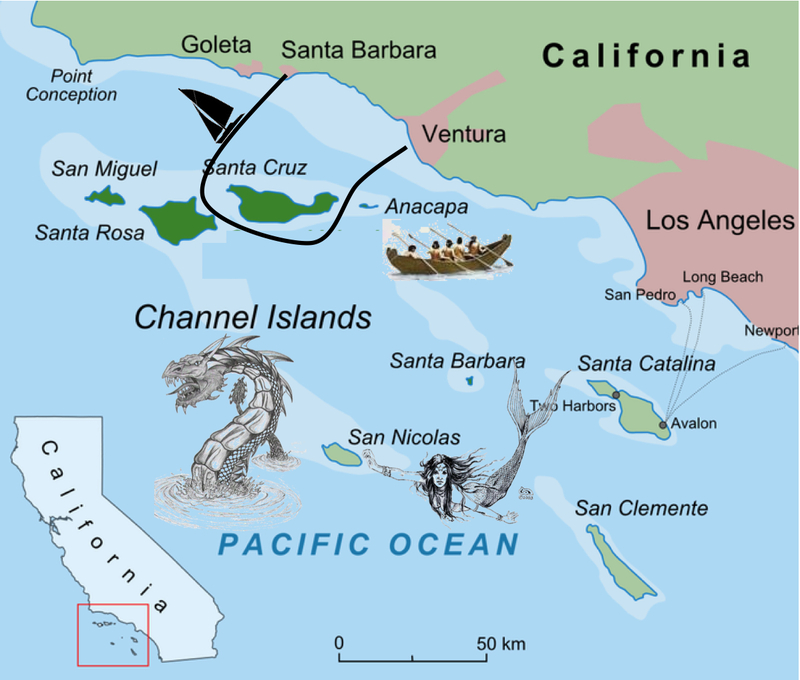 Archaeologists tells us that humans have been visiting (and living on) Santa Cruz Island for at least 9,000 years – most notably the Chumash Indian tribe, who lived on the island and traded with the mainland Chumash population. The Chumash had it to themselves until Juan Rodríguez Cabrillo showed up in the Channel Islands in 1542, planted the Spanish flag, lost his leg, and died. Cabrillo and his crew did not come ashore on Santa Cruz, though he named the island San Lucas. Sebastián Vizcaíno led the last Spanish expedition to check out the Channel Islands in 1602. Vizcaino’s map named Santa Cruz the Isla de Gente Barbuda (“island of the bearded people”), and in 1822, the last of those “bearded people”, the Chumash, left Santa Cruz Island for the Catholic missions on the mainland. We were just about to leave the vicinity of Santa Cruz ourselves at about 4:00 pm, flying a spinnaker and ripping along at 12 knots with the Eastern headland of Santa Cruz in sight – when nautical hubris got the best of us, and we were overpowered, rounded up – and knocked down! For those who are not salty enough to appreciate what it means to be “knocked down” — here’s a simple illustration. 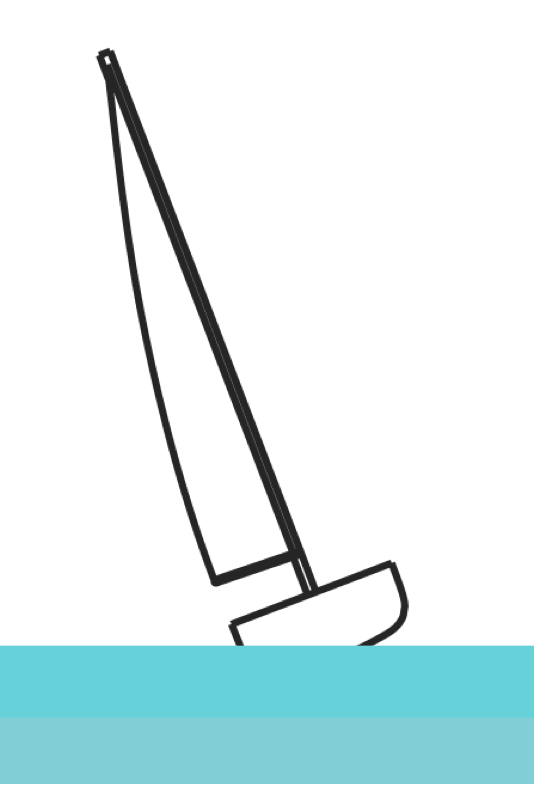 This is the normal profile of a sailboat, heeled over in the wind, at a slight tilt relative to the waterline. 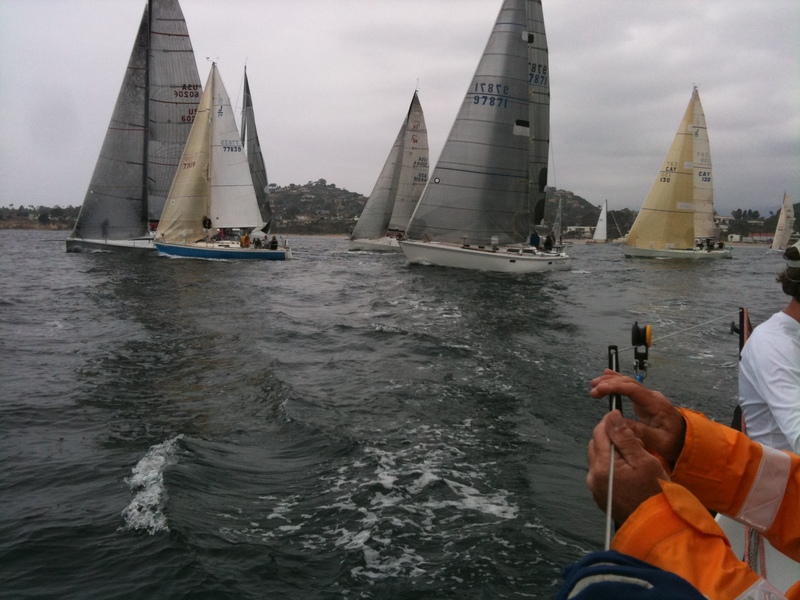 This is what you want to achieve when you’re racing a sailboat. This is the profile of a sailboat that has been “knocked down”. 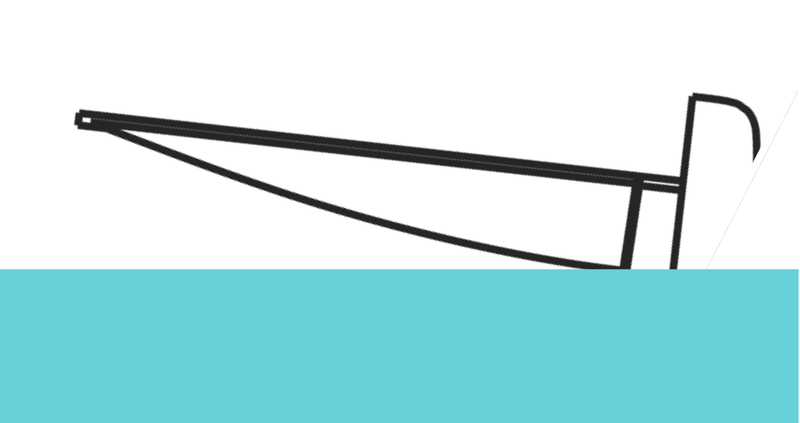 If it gets any worse than this, the keel will come out of the water and the boat will capsize. Here’s approximately where we were on the backside of Santa Cruz when we were knocked down. What was I doing in the moments before we got knocked down? 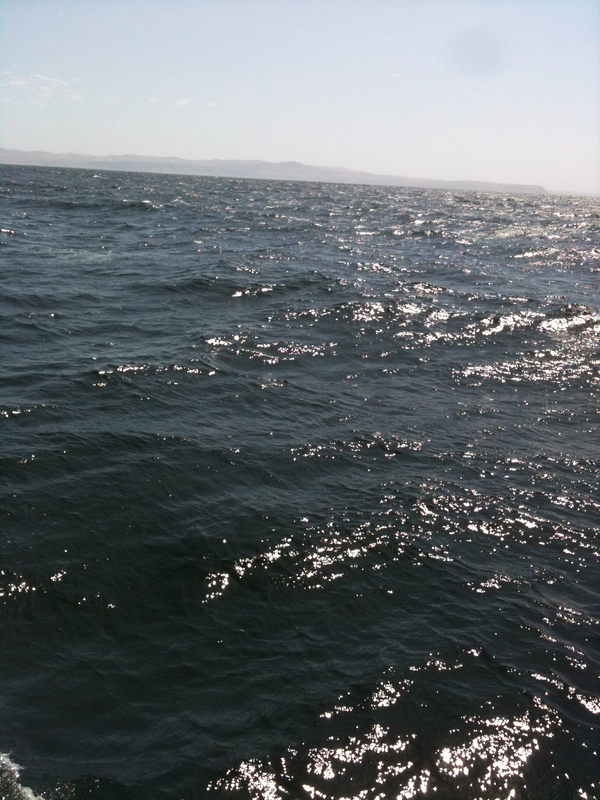 I was trying my best to capture the thrills and glory of our 12-knot surge through the swells with my iPhone. Here’s the footage I took in the moments before the knockdown. Moments later, at Tom’s authoritative urging, I tucked away my iPhone and clambered over him to get hold of a portside stanchion. 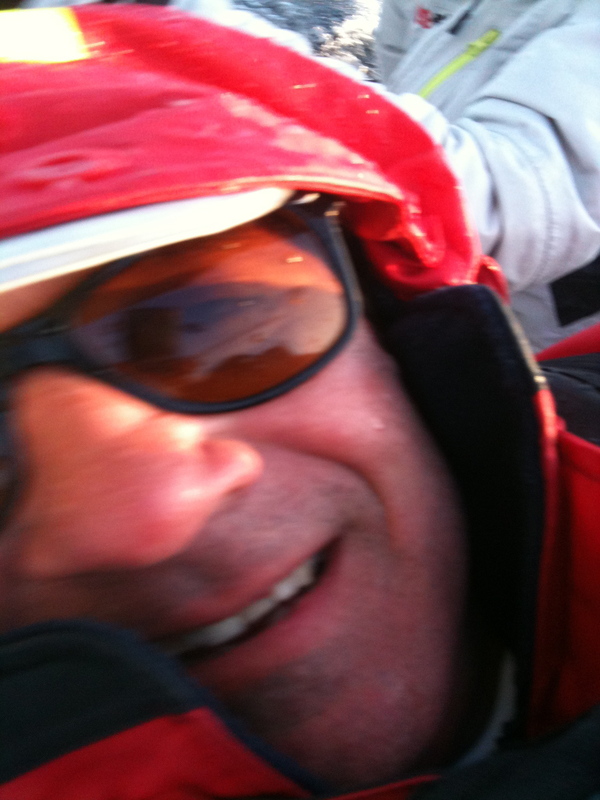 The fact that I was lying on top of Tom for a period of time before Misfit was righted led to the sort of off-color jokes that one comes to expect in the company of sailormen. I’ll say no more. 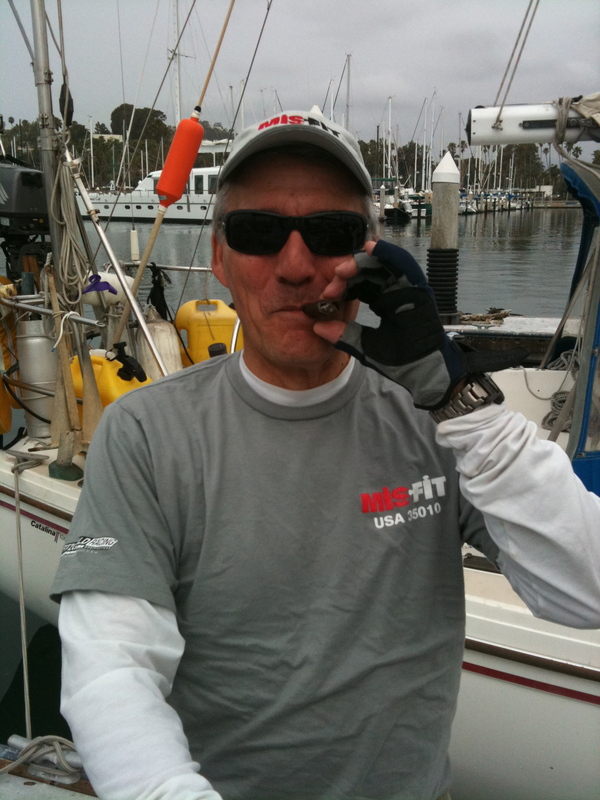 Once the boat was righted – and kudos to Eric, Geno and Reed for their seamanlike reflexes in a crisis – we made for Ventura Harbor on the last leg of the race. As dangerous as the knockdown was, it was also an undeniable thrill. An adrenaline junkie’s fix, for sure. Our spirits were aroused and our senses engaged, as we sank Santa Cruz behind us and raced the setting sun into Ventura Harbor. 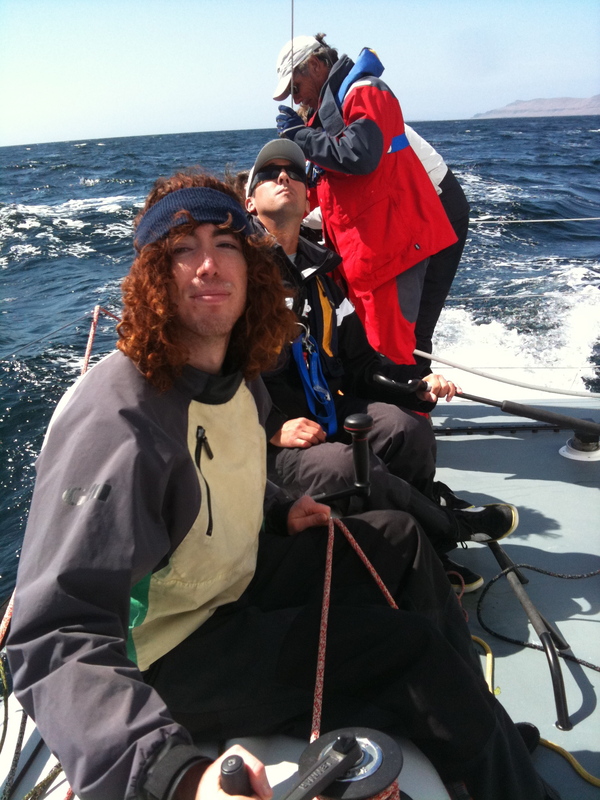 Hours before we rounded the Eastern end of Santa Cruz, our master of the fordeck, Claude, had expertly gauged the wind and waves and predicted that we’d finish just as the sun set at 7:45 pm. As we splashed our way toward Ventura, Claude’s assessment would prove to be dead on. His assessment of the cetaceans that cavorted in our path along the way was not as correct. 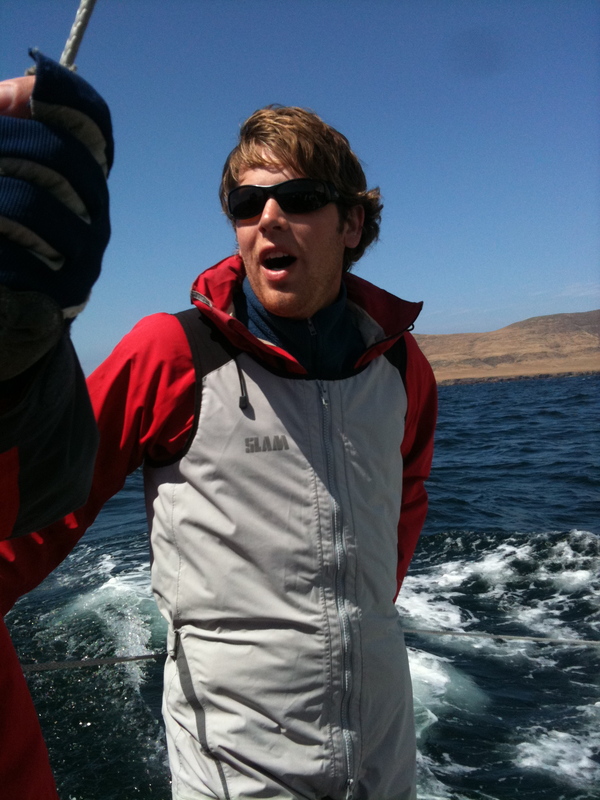 Seeing a pod of dorsal fin-less dolphins frolicking alongside our boat, Claude declared them to be porpoises. 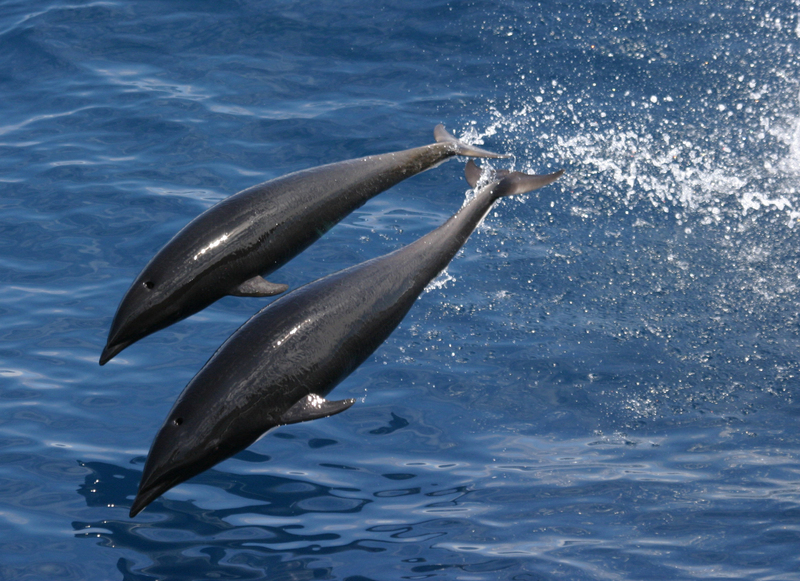 Just hours after the race, ever the conscientious oceanic naturalist, Claude would correctly identify them as northern rightwhale dolphins. Despite the screaming winds, Captain George and Master Eric desired more boat speed as we flew toward Ventura, and they called for us to fly the larger Code Zero headsail. But while Claude and Geno and I did our best to fly the Code Zero, conditions got the better of us, and precious time was lost. 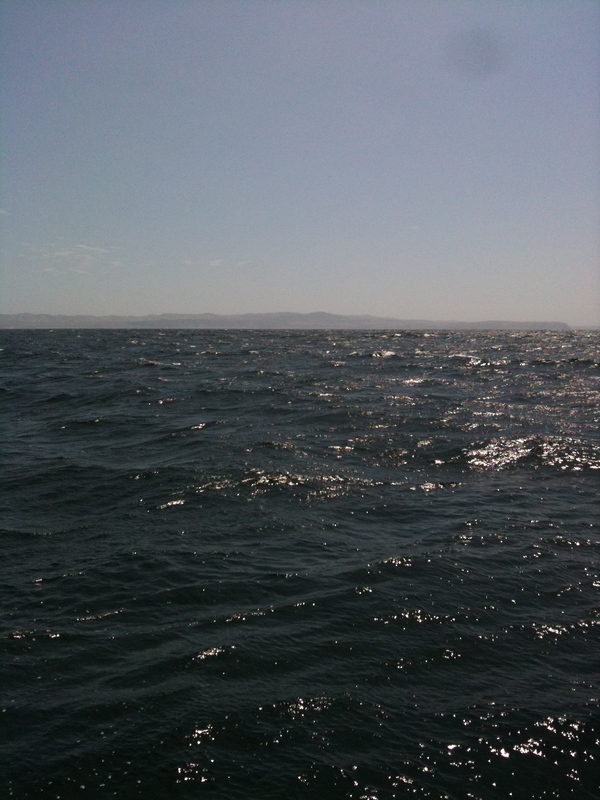 Still, we hurtled through the channel, pointed toward the red whistle buoy that marks the entrance to Ventura Harbor. The last hour of the race saw a constant drenching of the rail meat, as the geometry of boat speed and the direction of the swells added up to lots and lots of salt spray showering the benumbed human ballast — as Misfit tore through the waves like a trail horse smelling the feed bag. We crossed the line moments after 8:00 pm, completing our voyage from Santa Barbara to Ventura by way of the backside of Santa Cruz in a little more than nine hours. The sun was down as we eased into an open slip, tied off at the dock, and got our nautical thoroughbred Misfit squared away for the night. 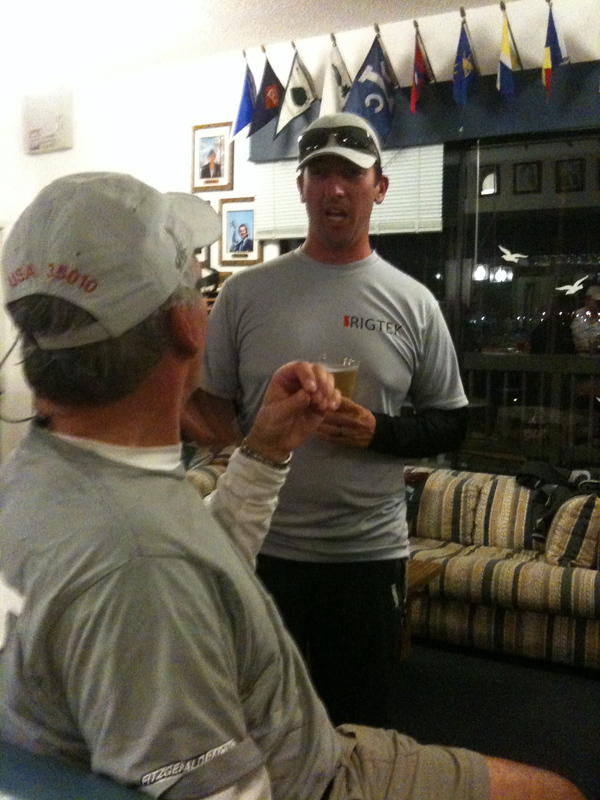 Finally, Captain George and his crew gathered at the PBYC clubhouse for a beverage and the last of the lasagna. There we learned that Misfit had finished a mere 4 minutes out of first place — and just 20 seconds out of second place. Clearly, the knockdown off Santa Cruz and our struggle with the Code Zero on the homeward-bound leg may have cost us the race. But, all in all, it felt like victory. The boat performed gloriously. The Misfit crew did, too. The Island Series is within our grasp. Next up: The Milt Ingram Trophy Race, July 16, 2011. Get your foulies on, mates — and unfurl as much canvass as we can! Crack on, Misfits, crack on! 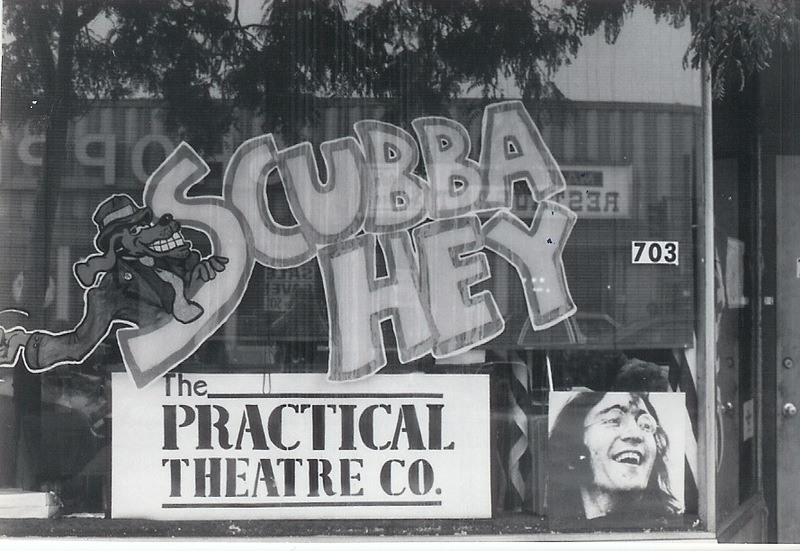 The Practical Theatre Co. Returns to Chicago! Just one month remains before The Practical Theatre Co. comes back to Chicago for a special one-week engagement at The Prop Theatre from June 9-12. 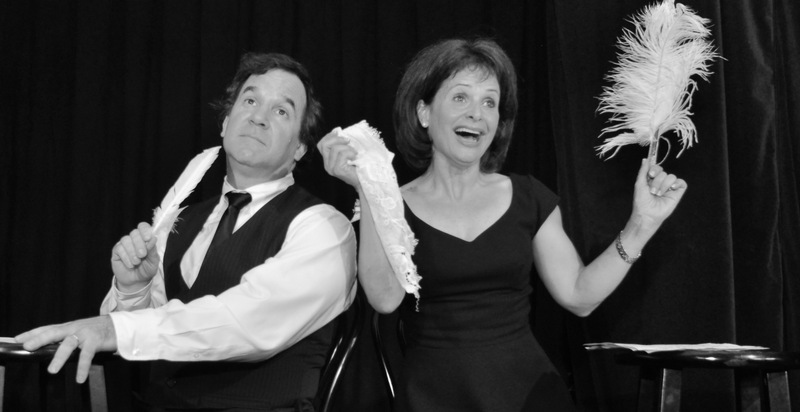 “The Vic & Paul Show” is “An Evening of Comedy, Music, Marriage & Martinis” featuring sophisticated comedy sketches and musical numbers in an intimate theatrical setting. It’s somewhere between Nick & Nora and Nichols & May (if those famous couples were over-50 parents with grown-up kids). Vic & Paul are joined at The Prop by their longtime PTC musical director and Chicago area Emmy-winner, Steve Rashid. 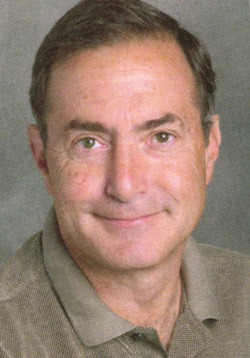 Chicago native Shelly Goldstein directed the show. There will be one preview performance on Thursday, June 9th at 8:00 pm. (Tickets $10.) 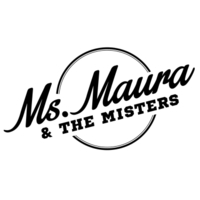 Shows are Friday June 10th at 8:00 pm ($20), Saturday June 11th at 8:00 pm ($20), Sunday, June 12th at 2:00 pm ($15) and at 7:00 pm ($20). Cash & checks only at the door. The Prop’s phone number is 773 539 7838. 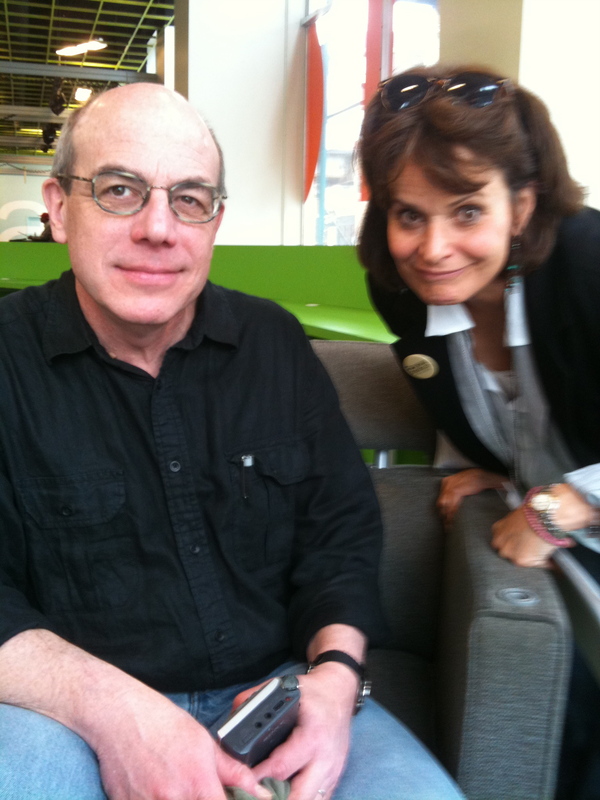 Note: Paul & Victoria will also appear on Saturday, May 21st at The Chicago Theatre Symposium, to make a presentation on the history of The Practical Theatre. The presentation will be made between 11:15 AM – 12:30 PM in Room 801C at Columbia College Film Row Center, 1104 South Wabash, 8th Floor. Vic & Paul are also scheduled to appear on Rick Kogan’s popular WGN radio, The Sunday Papers with Rick Kogan, on Sunday, May 29th at 8:00 AM. It’s going to be great fun to reconnect with the wonderful city of Chicago! First it was this guy. He appeared about a month ago, swimming in our saltwater pool, looking very picturesque: obviously a male duck (known as a drake) – and clearly a Mallard. Mallards are, after all, the most common wild duck in the U.S.
My wife and daughters and I were delighted to see him – and, as with all our pets, we christened him with a Shakespearean name, Shylock. 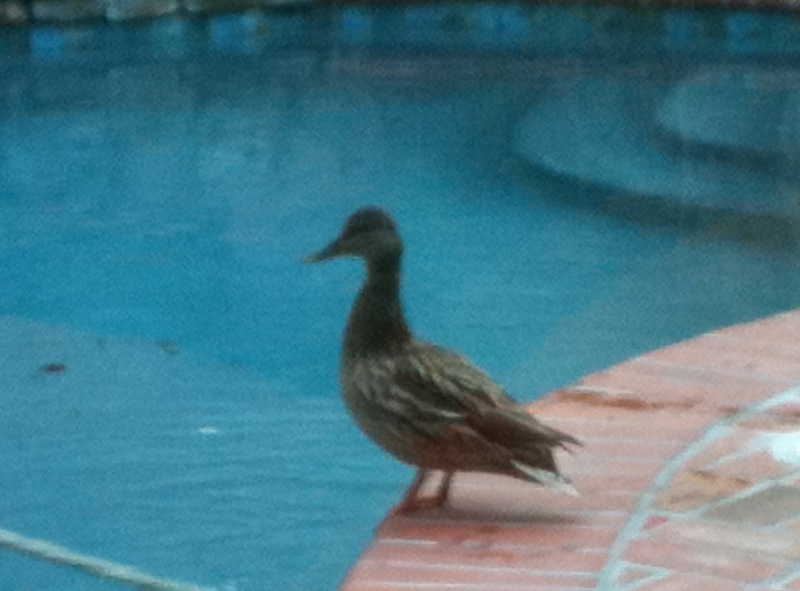 We were pleasantly surprised when Shylock kept returning to our pool. There were no fish in our pool, no minnows, no water plants, no edible fauna or flora of any kind (thanks to our pool men) – so clearly, Shylock was just passing through. Neighbors and other pool-owning veterans warned us that ducks would make a mess of our pool, clogging the filters and fouling the bottom. But I figured, how much damage can one duck do? Then, a couple weeks later, she showed up. She was obviously a female (known as a hen)– and thus was dubbed Lady MacDuck. From our hasty research, we learned that Mallards usually begin their migration back from Mexico and points south to their northern breeding grounds in March and April. So Shylock and Lady MacDuck were right on time. But where would they choose for their breeding ground? 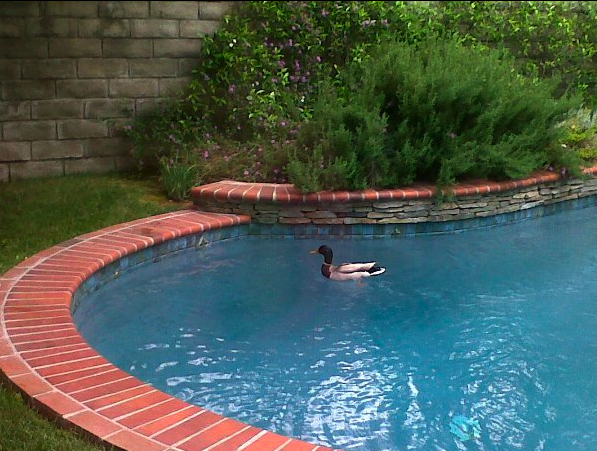 Surely, our backyard pool — a lifeless saltwater pond – held no permanent attraction for a pair of mating Mallards? 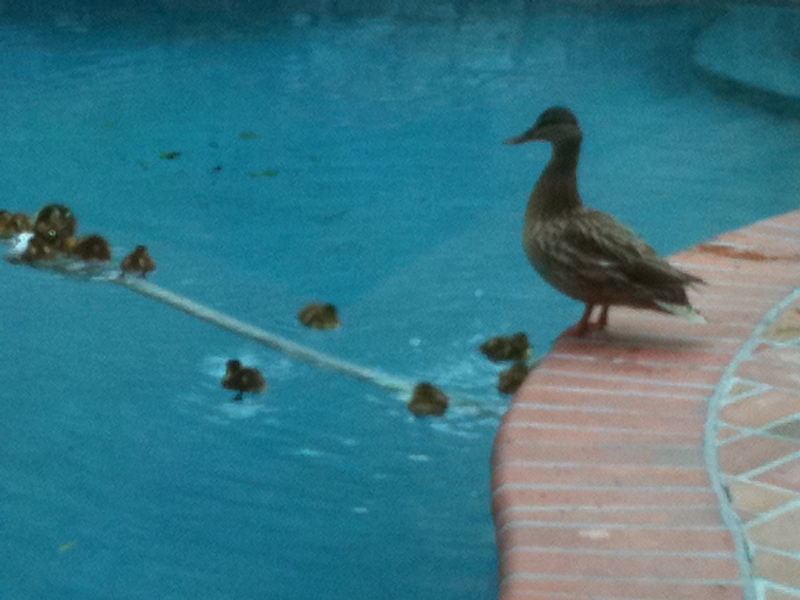 Lady MacDuck was proudly leading a squadron of twelve newborn ducklings around our pool. (Ducklings are precocial — capable of swimming as soon as they hatch.) Their nest, it turns out, was hidden in the landscaping next to the pool. From what I’ve read, the ducklings will be ready to fly in about two months (50–60 days to fledgling). Though, before I left for work today I looked around the backyard and didn’t see them. Which isn’t too alarming. Heck, I missed the whole 28-day egg laying, nesting and hatching process – and it was going on right under my nose! 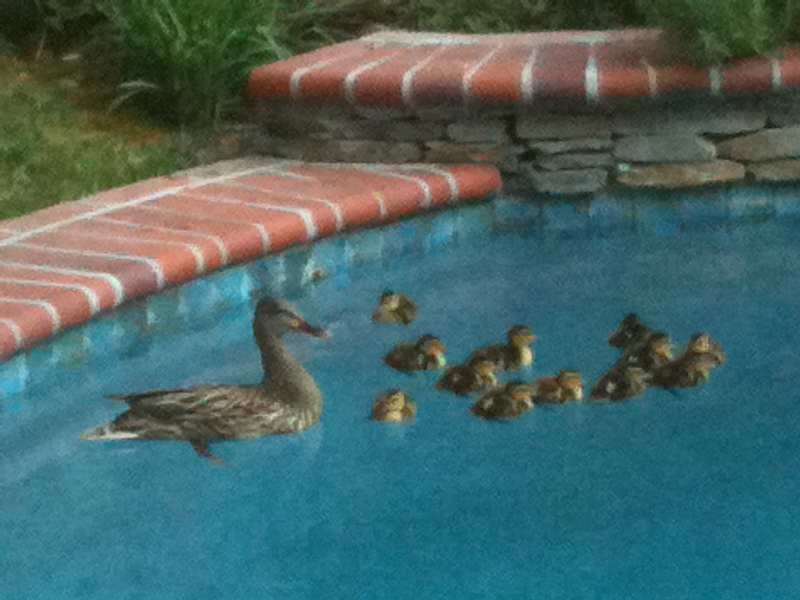 I’ve also read that female ducks tend to breed near the place they were hatched — or near a previous breeding site. If so, unless I missed all the previous backyard duck breeding action in past years, Lady MacDuck is an oddball. But, for now, she’s our oddball. 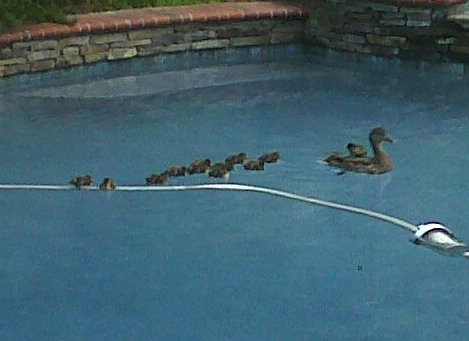 And her dozen ducklings are just about the cutest little cruisers you can imagine.